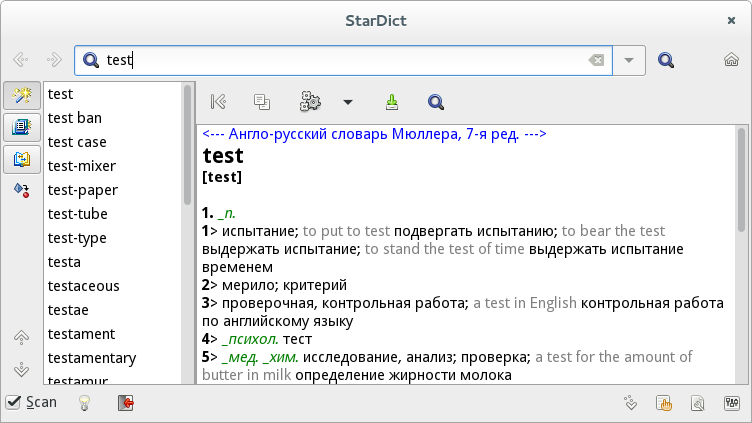 StarDict is a Cross-Platform and international dictionary written in GTK3. It has powerful features such as "Glob-style pattern matching", "Scan selection word", "Fuzzy query", "Full-text translation", etc. Stardict comes with tons of dictionaries available online. StarDict is just a dictionary shell, so when you download it you have no dictionary that comes along. You have to install dictionaries yourself. Currently there are two English-Russian dictionaries in the main repository (stardict-dic-enru-mueller7 and stardict-dic-enru-engcom) and some other dictionaries in the Education repository, but you can also install dictionaries yourself: just download them and extract their content in the dic directory (/usr/share/stardict/dic/). After a restart, stardict would find the dictionary and allows you to select it. As not all dictionaries are available as official stardict dictionary, stardict has a tool named stardict-tools (extra package) which can be used to convert dictionaries of DICT, wquick, mova and pydict to stardict format. This page was last modified on 4 July 2017, at 21:59.